Schools across the United States let out for summer in June, so Disney rolls out some of its best entertainment to keep families and kids happy. Look for new rides and attractions, fun shows, and extra long park hours. When you stay at a Disney resort, you can take advantage of Disney's Extra Magic Hours to ride busy attractions such as Splash Mountain or Test Track at less crowded times. Be prepared for the Florida heat and plan ahead to avoid the most crowded parts of the day in the theme parks. There are still a few quiet places in Disney, if you look in the right place you may be able to find a place to rest or let a little one nap. The Orlando area Gay Days celebration in early June adds extra revelers to the hoards of excited students kicking off their summer vacations. You can still make the most of your trip by using FastPass+, single rider lines, and the rider switch program, and by making dining reservations well in advance. June at Disney World comes in hot, hot, hot, with increasing temperatures and humidity as the month continues. June is also one of the rainiest months in Orlando. Most summer rainstorms dump their moisture in a flash and move on, so they won't dampen your plans for long. But Orlando sees about 6 inches of rain in a typical June, with the daily probability of a shower above 50 percent. So pack a poncho or umbrella for every member of your party or try one of these ​things to do at Disney World when it rains. The month of the summer equinox, June also sees nearly 14 hours of daylight each day, resulting in the start of extended park operating hours. Summer vacation calls for shorts and T-shirts, of course. You also need a bathing suit and a sweater or hoodie—it might seem silly to mention those items in the same sentence, but overzealous air conditioning can easily lead to a chill. Be sure to wear sturdy walking shoes on your park visit days, and bring an umbrella—unless you like getting caught in the rain. Most importantly, bring plenty of sunblock and re-apply it often every day, even if the sky looks overcast. The Florida sun can be brutal, and even people who claim they normally don't burn can find themselves turning dangerously red at Disney World. 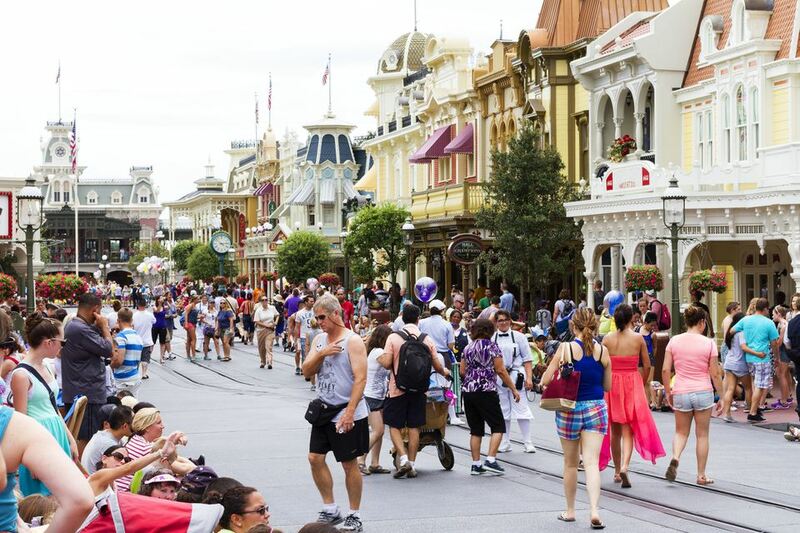 Disney World typically schedules special events during historically slower times to attract visitors. So while you might not find any singular occasions, Disney World often debuts new attractions in June, and you could be among the first visitors to ride the next big thing. Routine maintenance closures rarely happen in June, so you should be able to tick off all of the must-dos on your list. Make Advanced Dining Reservations (ADRs) and book experiences such as the Bibbidi Bobbidi Boutique up to 180 days before you leave home so you can be sure you get the date and time you want. Carry your bathing suit so you can take an afternoon dip in Shark Reef at Typhoon Lagoon. Its chilly waters are the best place to cool off on a hot day if you don't mind swimming alongside real sharks and other marine life. Bring along a refillable water bottle. You need lots of water to combat the heat and stay hydrated, and it will save you money. Expect to wait in some hefty lines during June, especially on slow loading attractions like Dumbo the Flying Elephant and Big Thunder Mountain Railroad. Use the My Disney Experience mobile app to keep track of wait times and delays in various parks, and you'll never have to trek to a tip-board again. Keep everyone safe and healthy by reviewing some ​common-sense safety rules before you enter one of the parks, just in case you get separated. To learn more about the pros and cons of visiting Disney World during June, check out our guide on the best time to visit.